Today is our last saturday before we go to the mountains - First we grabbed a coffee at starbucks to warm ourselves up, without it we probably wouldn't have survived - it's freeeezing in Zurich! We decided to show you the "Sankt Peter church" with the beautiful square in front of it! We just love to sit on that bench and talk, especially in summer! We hope you are all having an amazing weekend and you enjoy this post! You have a lovely blog! Following you now. Hope you can share the love back by following/visiting my blog. If you want to follow me I'll be very happy!Hugs .. I like your look. I love the satchel! And thaks for your coment! great looks! love both! the bags are amazing... the neon and the silver one! Both of your looks are s cute! It's so cool that you have such different styles. I'm obsessed with preppy and edgy style! Great bags, both of you! both of you look great!! Nice outfits! Thanks for your thoughtful post on my blog; I'll be sure to check out yours more often! Very nice outfits and I really like that yellow purse. Have a great day. I love your bag <3!!!! !Visit http://www.urbanfashionstylee.blogspot.mx and check my new post!! oh that punchy satchel! Gorgeous! Beautiful boots dear girls! I like them! Love your style, great blog! I've been in Zurich 1 month ago! You have such a beautiful city and country! And ladys you look stunning! Very chic! thank you for comment! Amazing shoes and bag of course! You have all sweet outfits :) Thanks for your sweet comment btw I'm following you I would be happy if you follow me too. I want to see Zurich someday it looks amazing maybe this summer I can consider about visiting there. What about following each other's via facebook? God I love both bags and the leopard boots!! The boots are fabulous and so are the bags! I am following you on GFC, I hope you will follow me back. Loved your blog so much..
thank four your comment!!! I love your style!! I follow you!! love both your bags :) it always makes me happy when the weather seems to cooperate with my want to take photos! damn girls you look so good! Oh I love that satchel and the leopard print boots. great outfits girls! Hello dears, Your blog really awesome and you are sooo cute! You look so nice, adorable outfit! loved both of your outfits! your bags are amazing! wow, Mädels, You both have amazing taste of style <3 i'm impressed <3! I love your bags and booties! Oh my the neon bag and the leopard print boots are stunning - WANT WANT WANT!! I love the leopard boots!! Hi girls! Have a great time on the mountains! Beautiful pics and great outfits! Really nice pics and lovely looks! Both of your outfits are so cool ! Love these looks, that scatchel is to die for. And the spacy weater :D It looks like a lot of fun. I hope you guys have a great time in the mountains! I'll be going to adelboden at the beginning of march and I'm so looking forward to it! 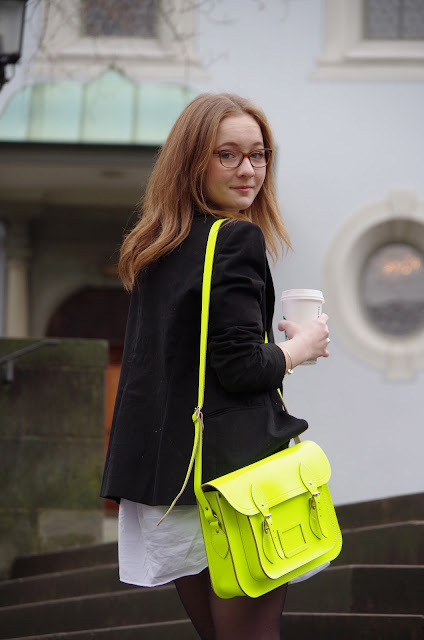 I'm loving that Cambridge satchel - a shocking color, but in a really good way!